The big day for the village of Manunu had finally arrived. With funding from the United States Embassy and help from the Peace Corps, the village’s primary school is now equipped with a new Creative Learning Centre. The facility will serve as a pilot project for similar ventures in the future. HELPING OUT SAMOA’S RURAL SCHOOLS: (left to right) Dinah Iusitini, Program Manager of Peace Corps, Sherry Russell, Country Director of Peace Corps, Menu Eili, Principal of Manunu Primary School, Shirley Fetu of M.E.S.C., Stacey Lissit, Monitoring and Evaluation Specialist from Washington, Emily Armitage, Chargé d'affaires at the U.S. Embassy, Matiu Tailetai, CEO of M.E.S.C., Dr. Joanie Cohen-Mitchell, Chief of Programming and Evaluation in Washington and Peace Corps volunteer Josh Tarbox. On the day of the opening, all attention was on the man who had finally accomplished to finish the project: Peace Corps volunteer Josh Tarbox. After the project was approved by the United States Embassy and the Peace Corps, the amount of ST$25,000 was ready to be spent for the Learning Centre. 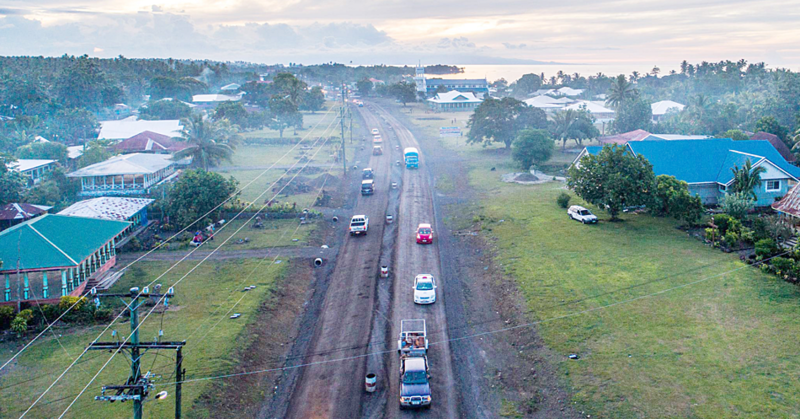 From that point on, Josh started his journey through the shops of Samoa’s capital, until he had every piece together to furnish what would become a place to study, learn and discover for the students at Manunu’s primary school. 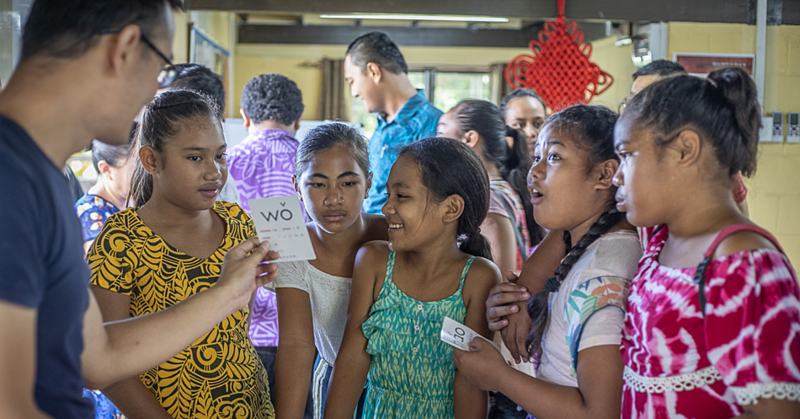 “I think all of the schools in Samoa need to have a place like this, but Manunu especially, because we’re far up into the mountains and our literacy rate is very low”, the young American explained at the new Learning Centre’s opening. The literacy rate, which according to Tarbox has improved at Manunu Primary School for about 50% since he has taken over the role of the Peace Corps teacher at the place two years ago, is the reason for the school’s new Learning Centre. “Me, the principal and another volunteer in Savai’i were thinking of how we could boost that [low literacy rate] in a fun way that the kids will enjoy. Instead of just buying a flat screen TV or tons of one item for the school, we asked ourselves: how can we put all that into just one room?”. With the Creative Learning Centre, they have found the answer to that question. “Instead of having a computer room and a library in the same old boring classroom, we tried something new which would make it fun and where the kids actually want to spend time in, with bright colours and excitement that would encourage them to read”. But the room’s design does not only follow an aesthetic aspect to let the children pick up a book, there was also a certain concept that Josh Tarbox had in mind when designing it. “We’re integrating literacy in all different areas. On the computer, they’re going to be able to copy a page from a book or they can make an art poster to match with what we just read. They’re all doing it in the same room at different stations”, he told. The centre is equipped with a reading area, a computer area, an arts area, enough space for educational games and is supposed to serve more than 60 students from year one to year eight. The Peace Corps Volunteer is indeed not an unknown face in the village. The first project he had initiated while serving as a volunteer in Manunu included the improvement of the place’s supply with fresh fish, as the primary school’s principal, Menu Eili was able to explain to Samoa Observer: “When Josh arrived at our school last year, he asked me what projects the school could benefit from. I already knew him from the fish pond project he had built up in our village last May. So I told him that the school needed a library. He sent an apply for money to the embassy of his home country here in Samoa. When the donation had arrived, he started to do all the shopping for our Learning Centre”. For Mr Eili, the successfully accomplished goal of building up a Learning Centre will be a huge benefit for current and future generations of students in Manunu. “I am very proud of it. There’s nothing more important than supporting our children’s literacy and numeracy. And with this special centre at our school, this opportunity will be given to every single student”. This opportunity was also valued by the United States Embassy and its Regional English Office (R.E.L.O. ), that had provided the donation to finance the centre in Manunu. 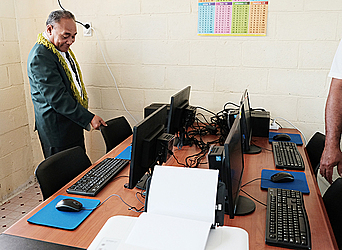 Emily Armitage, Chargé d’affaires at the embassy, explained that while being the first of its kind in Samoa, the Creative Learning Centre in Manunu will not have this privilege for a long time: “The second centre will be opening soon in Gataivai, Savai’i. We want to create spaces that promote youth engagement while also providing resources and technology for teacher’s professional development and continuing education”. As she pointed out, future plans include the implication of similar projects in many different locations in Samoa. 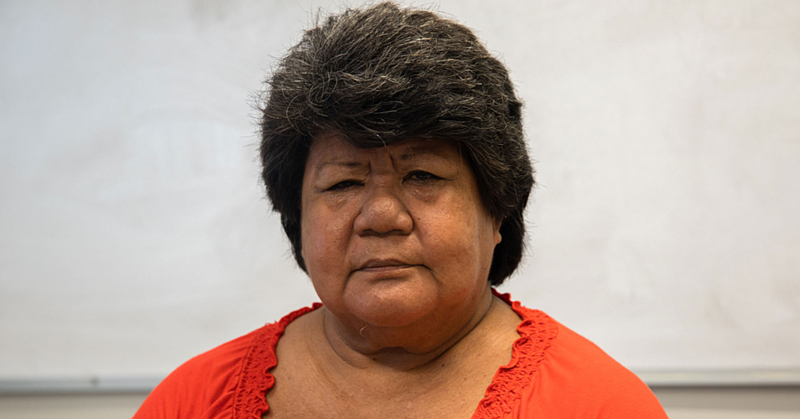 “It is our hope that these pilot creative learning centres will set the standard for other Samoan communities to establish such centres within their primary schools”, she said.